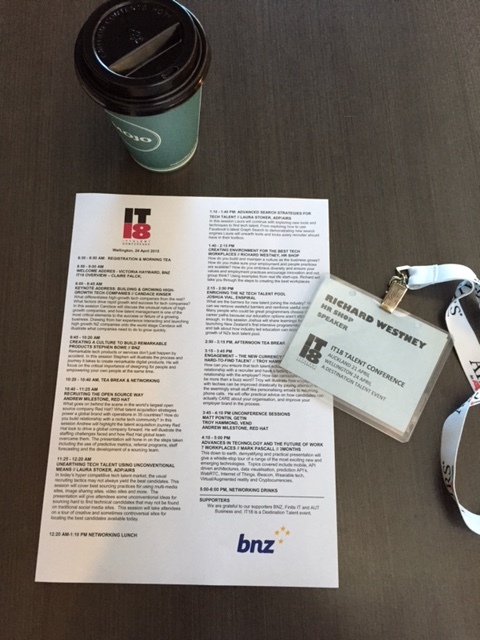 I have been deeply immersed in sourcing and talent attraction this week via a speaking gig at the IT18 Talent Conferences in Auckland and Wellington, and Wellington’s first Recruitment Meet Up which I’ve had a (small) hand in setting up. These have been massive learning opportunities for me because, while I have always been interested in the recruitment side of HR and try to keep up with what’s new and different, it’s not what I do every day and I’m no expert. Let’s take the meet up first. Wellington has really been lacking a regular recruitment-related network group and many of us have looked enviously towards Auckland where they seem to have a very vibrant community and regular network events. Vend’s Troy Hammond has made it his mission to put that right and this is his baby. The first meeting featured short presentations from Matt Pontin (GetIn) and Laura Stoker (AIRS/ADP from the U.S.) who have set a high bar for future speakers. It was relaxed, informal, focused on very different social attraction methods and the Enspiral Developer Academy was a perfect place to host it. Talking of Laura, Matt and Troy, they were also part of the IT18 Talent Conference organized by Phillip Tusung which is all about talent attraction and management in the technology sector. We are extremely lucky that Phillip keeps organizing these fantastic conferences in NZ and now tries to bring these to Wellington as well as Auckland. The quality of speakers we’ve had, including overseas speakers like Laura, at both IT18 and last year’s Social Sourcing Summit have made them must attend events for me. The line up of speakers and content was diverse and thought-provoking. He had clearly taken my feedback from last year on board (ha ha) and challenged me to put my money where my mouth is. I thoroughly enjoyed the challenge and, more importantly, I got a lot out of meeting and spending time with some of my fellow speakers and attendees. Joshua Vial from the Developer Academy followed me at the Wellington event and talked about Software Developers constantly learning to keep up with new stuff and stay current in their role. He said they need to be professional learners. I loved that but I also think it applies to all of us. There is so much new to learn and absorb all the time. Keep learning or become irrelevant seems to be the challenge. While I tried to shift some thinking around how to build and maintain the culture during business growth in my presentation, it was the earth that was moving an hour later in Wellington. Spare a thought for poor Troy, he was in full acerbic, ranting flow when his presentation was rudely interrupted by a prolonged 6.2 earthquake which had the lovely BNZ building rocking and rolling, and saw some people rushing for the exit never to return, and our foreign visitors wondering if they were about to die. The big guy was down off the stage and across the room faster than an Aussie bowler with a sledge but, in typical Wellington fashion, he was soon back up there and after a brief settling of nerves we just got on with the rest of the afternoon. Talking to attendees at both events, they were clearly getting a lot out of the day and Kylie Telford’s post is typical of what I heard from lots of people. Many minds were stretched and prized open by some awesome forces. We commemorate ANZAC Day this weekend and have been reminded once again just how at the mercy of Mother Nature we are in New Zealand, so it is sobering to recognise the incredible opportunities to keep learning and growing we have as professionals, and to appreciate that previous generations never had that opportunity. Make the most of it.